Coach's Corner Volume 23 - Defensive back conditioning and techniques are the topics in this edition of Coaches Corner. 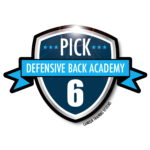 Host John Anderson talks with guest Jimmy Lamour of the Pick 6 DB Academy. Learn five ways to improve Defensive Back Play and more on this edition of Coaches Corner. NEW ! - now includes Chapter bookmarks that make it easy to select a specific segment of the program to maximize your listening efficiency. Your browser does not support the HTML 5 audio player.